Developer Quote: "A brand new fighting style has arrived to the mobile gaming industry.... and it's called Martial Arts !" Have you tried playing Street Fighter before on any gaming platform? It's a one of a kind game, and has always been a favorite. 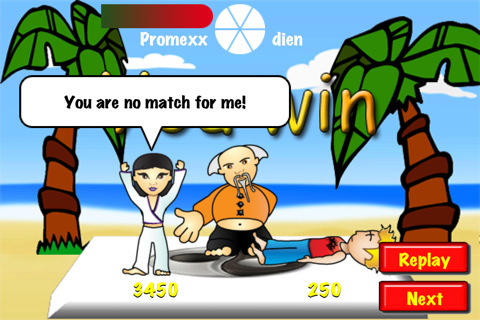 iChallenge-Martial Arts is not quite the same, but has a few similar features if you like exciting fighting apps (and we're not talking violence, blood or gore here)! * Choose a familiar battle or a random battle. * Choose between 5 characters each battle. * Challenge friends by e-mail address-book button. * Enter your personal (annoying) victory shout. * Bonuses for better attacks or higher health. Enjoy a battle with your choice of characters (Michael, Jax, Roza, Sun and Chang) while of course the Master oversees all! Each characters uses their own brand of native fighting arts. Particularly enjoyable is using your own victory shout when the occasion arises! Can't beat that for a customized fight! Work your way up from Student to Master to gain the coveted belt of 1,000,000 points. This is a tame version of Street Fighter, but perhaps will improve over time, and remember it is free! COOL CONCLUSION: "iChallenge-Martial Arts is suitable for all genders and ages, and may well entice you to enroll in karate classes to brush up on your skills!" --iOS/Age Rating: This app requires iOS 4.0 or later. Rated 9+.